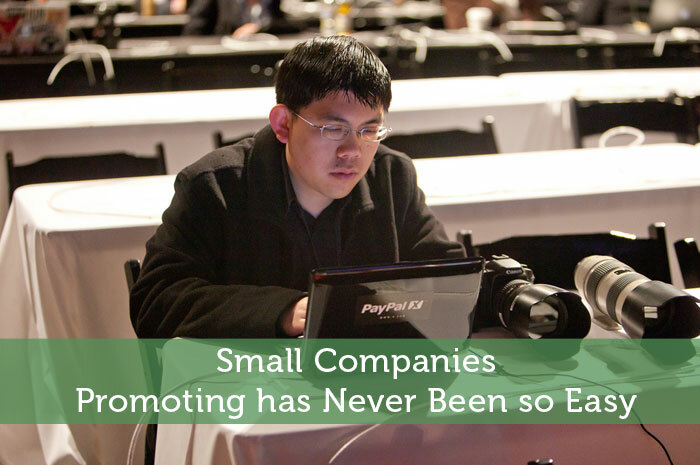 The following is a guest post about promoting small companies. If interested in submitting a guest post, please read my guest post policy and then contact me. When most companies hear about promoting, be they small or large, they tend to be a little less than thrilled and a little more than overwhelmed. Relax, everything will be alright. In this new age of digitization and self-promotion, promoting your business has never been so easy.Even the aspects considered to be the toughest part of the promotion process are relatively easy and don’t require too much stress to successfully complete. Let’s go over a few pivotal ways to promote yourself and your business without racking up the nerve bundle. Only a few years ago, people saw blogs as a means of ranting and raving about the next best thing, a performance, or a personal diary. Now, the marketing and business industries have caught on and have started utilizing blogs as a means to get their word out there. Small businesses can take a page out of their book and create a company blog. Also, like the pros, make sure that anchor texts and keywords are linked to your company’s blog. This will increase the SEO value, increase the blog’s search-ability, and create reference links to other pages within the blog, to a partnering company’s blog, or to any site of your choosing. Bear in mind, when you create a blog one of the most important things you can do is update it regularly. Updating the blog shows readers that you are more than willing to keep them in the loop as far as what your company is doing. You’ll want to stay as current as possible. Consider this your newsletter and you are the greatest source of content creation. When information becomes stale readers tend to drop off. If readers drop off, your clientele pool might start to dwindle. You want them to think that you are staying on top of your workload and their business and a properly maintained blog is a great way to express that. Plus, the content you provide could also help out with the “word of mouth” angle. The great thing about social media is that anyone can use it. The only hardened downside to social media is that you need something to be social about. Promoting your company via social media sites is a lot easier than a lot of people might think. Your company is the “something” that is needed to be social about. You don’t want to overload users on Facebook or Twitter with long winded explanations about your company. Instead, you’ll want to give a brief and, often, witty synopsis about your company. Internet users don’t want to read a book, they want something that is quick and to the point. If you feel that you want to promote your site but avoid being a spam generator you can link to your blog and a relevant post about the topic of your social post. This way readers will be more interested in what you have to say, have a resource link, and you don’t have to bombard them with expressions, sayings, and too many words that will immediately turn them off. If you want to reach out to a specific group of social media users, search for others in your industry. This will take a little bit of work but it’s far from hard. Just do a search for the other companies and look at their social media campaigns. This will give you a template to look at in terms of what you want to do and what you want to avoid. You can even see what other people are saying about their campaign and tailor yours to better fit the needs and desires of your target audience. Feel free to tweet or share some things that the general public are doing and saying as it pertains to your company or industry. Only a few things get people more interested than seeing their name, post, or content was mentioned by someone else. It often strikes up a sense of curiosity which will lead them right to your site. From promotional shirts to promotional pens gear has been one of the most subtle means of promotion since the hard-copy era. Companies have been utilizing promotional gear to get their business word out and about for decades. Everything about promotional marketing screams subtlety, which is exactly what you want as a small business. You don’t want to be known as the business that runs up to its future clients and consumers screaming your mission and why they should choose you over the competition. Instead, try going to quieter route: handing a consumer a company pen when they’re looking for one of their own and allowing them to keep it, or having all of your employees wear the company shirt while going on a fun outing. This peaks curiosity and doesn’t have to as expensive as many would have you believe. That’s not to say that you should go overboard with promotional gear, but if you have created a budget for it, you should utilize it to the best of your ability. If you have created a marketing budget for your company, email campaigns are the way to go. If you want to reach out to people in this digital age. This doesn’t mean go up to your company mailing list and just blast emails to any and all people on the list. You’ll want to customize the emails you send. If client A is more interested in products A and C, and client B is more interested in products D and F, you don’t want to send both clients emails A-F, you want to send the emails that correspond with those clients. Your rate of conversion will be much higher if you customize the emails to reflect the campaign and the target of your campaign versus a generalized “batch and blast”. Your target consumer pool wants to feel like you’ve taken the time to properly reflect on them and your potential consumer pool wants to know why they should give you the time of day. If you’ve acquired a mailing list via the social media route, you really will want to make sure that you aren’t just sending generalized emails. Customizing increases the chance that their email will see your content as relevant, avoiding the spam folder, and potentially get your new consumer interested in you company and product via campaign. You always want to utilize options such as these first. If for no other reason, than to gauge how your promotion and marketing efforts are going. The preferred end result is a good recommendation via word of mouth and product quality. Don’t skimp on your promotional efforts, but don’t overstress about them either. The digital age and time-held classics are here to help you through your promotional period. Well the whole beams and damping part went over my head, but it sounds like a very successful promotion. Some swag at tradeshows is completely useless and ineffective, but if it’s something they can actually use, it has a much better chance of closing a deal…even more so if it directly relates to your service. Digital options really provide a cheap outlet for small growing businesses to promote themselves. The best part about it is the potential reach that the advertising can have. They aren’t limited to just the neighboring towns or cities. Entire new countries are easily within reach with social media. Yes marketing online does open up all kinds of potential exposure. Search engines may have made it tougher for the small companies to thrive but social media can be quite effective when used right. The internet provides so many new and different options for promoting a small business. I’m amazed at how often I come across a service to help me out that I’ve never heard before, but has been around. Yes there are certainly so many ways to promote a business online. It’s a shame that more small businesses don’t know about all of those opportunities. We market ourselves online mainly and I have been impressed by the number of inquiries we get from all over the world. It is little work compared to the reach you can get. The international nature of online marketing is pretty cool. Rather than fighting the local competition you can carve out a spot in your niche online and do quite well. I have done all of the above marketing methods to promote my new e-cigarette business except the promotional gear. I never realized a simple gift such as a pen has such impact. I definitely overlooked this and will try it soon. Thanks for sharing this great advice.